This year The Fierce And The Dead will perform their first ever show outside the UK, when they hit the stage RoSFest in Gettysburg on May 7th. The instrumental experimentalists have been making waves in prog circles as the cult band that could make it big. Those who were lucky enough to catch them in concert rave about their heavy metal avant-grade post-rock compositions. Tracks from their studio output sound more aggressive and they like to road test new songs as well. You had to be there. For the rest of the world the new album Field Recordings (live) offers the power of the band while sitting in the comfort of their own home. Huge speakers might help, as well as accommodating neighbours. The Fierce and The Dead always like to explore different moods within a composition, shaking things up and slowing down. Opening with two oldies, In Your Face and Ark they cover new ground with Dancing Robots, a hybrid of guitarist Matt Stevens's solo output and "Red" era King Crimson, with drummer Stuart Marshall making good use of his cymbals. Bass player Kev Feazy is the guide during another new one, Verbose, sounding like John Entwistle letting rip during a prog metal workout. They bring the set to a close with the pastoral Palm Trees and guitarists Steve Cleaton and Stevens setting up a conversation during 666...6. 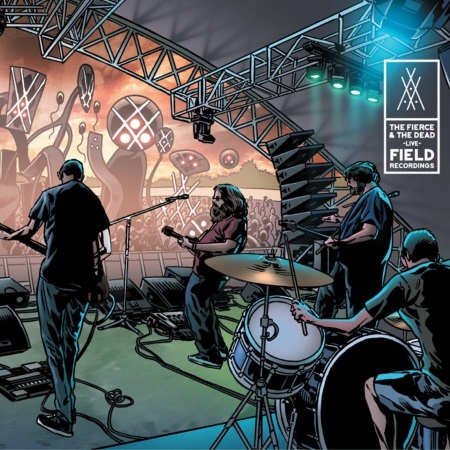 Field Recordings (live) has all the trappings a memorable live album - no frills, expert musicianship of a band enjoying themselves, and it's over way too soon, leaving the listener wanting more. Field Recordings (live) is released thru Bad Elephant Music (CD, digital, and - very limited - cassette). Preorder from their website. The tracks were recorded live at the Ramblin' Man Fair in Maidstone, 24th July 2016. The artwork was created by Mark Buckingham, the comic book artist who also designed the packaging for their Magnet EP. Release date: April 28th. The instrumental experimental post-rock quartet will perform at three leading progressive festivals.